Imagine yourself lost in the woods without a compass or GPS. An accurate sense of direction could save your bacon; so which way is north or south? In the Northern Hemisphere the sun rises in the east and sets in the west. At noon the sun will appear in the middle of the horizon and directly south. Walk facing the sun and you will be heading south, sun at your back sees you trudging north. For the Southern Hemisphere simply reverse the process. Not noon, don’t know the correct time – here’s another method. Find a stick about a metre long, drive it straight up into the ground of a sunny spot. Mark the end of the shadow it casts with a rock. This will be west. Wait about 15 minutes then mark the end of the cast shadow with another rock. This will be east. Draw a line between the two points for your east/west position and another at a 90 degree angle for your north/south line. No sun? Look for moss on trees – moss on the southern side is usually greener and thicker. Ants also build their hills on the warmer southern side of trees or hills,just as snow melts faster on southern exposures. What if night has fallen? If the moon rises shortly before sunset the bright side will face west. If it rises much later around midnight, the brightly illuminated side faces east. 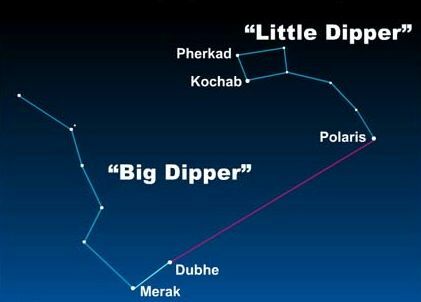 If you can’t see the moon but the sky is clear enough to find stars, look for the Big Dipper, next find the Little Dipper and draw an imaginary line between the two brightest stars in the bowl of the Big Dipper to the brightest star in the handle of the Little Dipper. This should take your eye to Polaris or the North Star; the bright middle star in the constellation Cassiopeia. I’ve only ever been lost once, and that was in a department store when I was four. If I ever find myself lost in the woods – at least I’ll be able to find my direction home.